Blue Jays right-hander Ryan Tepera and Nationals righty Kyle Barraclough have lost their arbitration cases against their respective teams, Jeff Passan of ESPN reports (via Twitter). Tepera will be paid at the $1.525MM rate filed by the Blue Jays rather than the $1.8MM figure submitted by his camp. Barraclough, meanwhile, will earn $1.725MM rather than the $2MM at which he filed. Tepera, 31, isn’t exactly a household name but has emerged as a quality setup piece for the Jays over the past four seasons. In 193 2/3 innings to this point in his career, he’s compiled a 3.49 ERA with 8.8 K/9, 3.2 BB/9 and a 44.8 percent ground-ball rate. The righty stepped into a ninth-inning role for a bit in Toronto last year and tallied seven saves to go along with 19 holds. The loss in today’s case will set a lower launching point for Tepera in future cases, thus limiting his earning in each of his next two trips through arbitration before he reaches free agency after the 2021 campaign. Barraclough, 28, hasn’t even suited up for the Nats yet, as he was acquired from the Marlins in a rare October trade. He’s posted gaudy strikeout numbers through the first four seasons of his career but also battled control issues, having ultimately logged a 3.21 ERA with 11.5 K/9 against 5.5 BB/9. Last season was Barraclough’s worst, as he turned in a career-high 4.20 ERA with a career-low 9.7 K/9. He did, to his credit, tally 10 saves in a partial run as Miami’s closer. As is the case with Tepera, he’s controlled through the 2021 season. As can be seen in MLBTR’s 2019 Arbitration Tracker, today’s rulings have evened the score between teams and players at three victories apiece. The Nationals announced that they have acquired reliever Kyle Barraclough in a trade with the Marlins. $1MM of international bonus availability will head to Miami in the swap, Clark Spencer of the Miami Herald reports (via Twitter). This transaction comes as a surprise, though the timing may well be explained by the Marlins’ well-known efforts to land top Cuban prospect Victor Victor Mesa. This’ll pad the team’s bonus coffers as it pursues Mesa — also a reputed target of the Orioles — and other talented amateur players who hail from outside of North America. For the Nats, meanwhile, the move slots in a high-powered relief arm at a palatable price. The club was barred from spending more than $300K on the current international market regardless. And Barraclough projects to earn only $1.9MM in his first trip through arbitration. Of course, there’s a reason that Barraclough was available for a return that doesn’t really sting his new club. The 28-year-old continued to show big velocity and swing-and-miss stuff in 2018 — he owns a career rate of 11.5 strikeouts per nine — but he continued to deal with major control problems and his results plummeted over the course of the season. Indeed, after he held 170 opposing hitters to a putrid .126/.254/.217 slash to open the season, the next 75 to step in the box against Barraclough battered him to the tune of a .367/.486/.667 batting line. It’s hard to know just what went wrong, though some release-point issues seem to correlate with changes in the movement of his arsenal. This all occurred in the same general mid-season timeframe as Barraclough’s dip in effectiveness and trip to the DL for a shoulder impingement. For the Nats, then, this move injects a rather volatile piece into the bullpen. There’s certainly some upside, though; indeed, Barraclough has delivered 218 2/3 innings of 3.21 ERA ball in his career despite the fact that he has consistently issued more than five free passes per nine innings. If he pans out, he’ll also be controllable for two additional seasons. Surely, the Marlins hoped not long ago that they’d be able to get more for a controllable power arm with high-leverage experience. Unfortunately, though, they ultimately decided to cash him in at a moment when there was an opportunity to take a more future-oriented risk. In some regards, that’s not so different from the reasoning that brought Barraclough to Miami in the first place, when he was picked up in a mid-season deal that sent then-struggling closer Steve Cishek to the Cardinals. Along with the previously reported Nationals, the Astros had interest in Marlins catcher J.T. Realmuto prior to the July 31 non-waiver trade deadline, according to Nick Cafardo of the Boston Globe. Both teams’ interest in Realmuto dates back to at least last offseason, but neither they nor anyone else have been able to pry the star backstop out of Miami. Instead of Realmuto, the Astros ended up acquiring the much less exciting Martin Maldonado from the Angels before the deadline. He’s backing up Max Stassi, who has emerged as the Astros’ starter since Brian McCann underwent knee surgery a month ago. Stassi got off to a great offensive start this year before cooling off significantly over the past couple months, though he is having an elite season behind the plate. The Red Sox inquired about Marlins closer Kyle Barraclough before the deadline, but Boston ultimately “backed off,” Cafardo writes. Barraclough wound up staying with the Marlins, who placed a high asking price on the flamethrowing right-hander. The 28-year-old hasn’t been good of late, as his ERA has skyrocketed from .99 to 3.28 since the beginning of July, but he still comes with a quality track record and affordable team control. As a result, the Marlins elected to keep Barraclough, who will make his first of three possible trips through arbitration during the winter. In an interestingly timed move, the Angels announced Sunday that special assistant Eric Chavez will manage their Triple-A team in Salt Lake for the rest of the season. Previous manager Keith Johnson will finish the year on the Angels’ coaching staff, and GM Billy Eppler said Sunday that the Halos want him to work with their young infielders (Twitter link via Mike DiGiovanna of the Los Angeles Times). The decision to replace Johnson with Chavez raised eyebrows, though, given that the latter has come up as a potential replacement for Angels skipper Mike Scioscia, who’s reportedly going to retire at the end of the season. The 40-year-old Chavez, a longtime major league third baseman, had never managed at any level until the Angels handed him the Triple-A reins. Standout White Sox outfield prospect Eloy Jimenez is “getting really close” to earning a major league promotion, director of player development Chris Getz said Sunday (via 670 The Score, on Twitter). The 21-year-old Jimenez, whom Baseball America, MLB.com and FanGraphs all regard as the game’s third-best prospect, has hit an astounding .376/.425/.679 with eight home runs and a .303 ISO in 120 plate appearances since the White Sox moved him to Triple-A Charlotte in late June. As they look to improve a roster that has performed at a high level this year, the Red Sox are interested in adding impact in their late-inning relief mix, according to a report from Jerry Crasnick of ESPN.com. We heard yesterday that the team has interest in Orioles southpaw Zach Britton (see here and here), but he’s certainly not the only potential target. At the moment, it is not clear if the Boston organization has any particular pitcher in mind. Crasnick indicates that the team is “blanketing the relief market,” so it appears that there are still quite a few possibilities. It’s not surprising, of course, to learn that a clear contender wants to improve its bullpen. That’s almost a given in this day and age, when the ability to deploy a variety of quality relief arms in optimal fashion can make all the difference in high-leverage situations in critical games. The key takeaway, though, is that the Sox aren’t just looking to add another solid set-up option. Rather, the report indicates that the organization wishes to obtain a high-end, difference-making arm. Notably, Crasnick suggests that the pending free agency of elite closer Craig Kimbrel is a factor, perhaps indicating that the Red Sox will be particularly interested in a controllable player. The Red Sox did just welcome Tyler Thornburg into the fold after a lengthy rehab process. He has worked in the 93 to 94 mph range in his first two outings, below but also in sight of his most recent levels. But the club really can’t know quite what to expect yet from him. One interesting element to consider here is the fact that the Red Sox depth chart exhibits an obvious weakness from the left side. The just-recalled Jalen Beeks is currently the only southpaw in the pen, though perhaps Drew Pomeranz could ultimately be utilized in relief once he’s back to health. Clearly, a power lefty would make particular sense, which helps explain the look at Britton. And there are other premium late-inning southpaws that could be available — though none at a low price. Brad Hand of the Padres and Felipe Vazquez of the Pirates are perhaps intriguing speculative targets, but they will require a massive haul to pry loose given that both recently inked high-value extensions. There ought to be other potential hurlers to consider on the left side, of course. Zach Duke of the Twins has been excellent and is an affordable rental player. The Marlins’ Adam Conley is showing that his stuff can play up from the pen. Despite a thin track record of late, he comes with cheap control, meaning the ask will likely be fairly high. Other possible options include Jake Diekman (Rangers), Jerry Blevins (Mets), Aaron Loup (Blue Jays), and Luis Avilan (White Sox). It seems, though, that the need for a southpaw will not necessarily drive the team’s approach when it comes to installing a high-end arm. Per Crasnick, the Red Sox have taken a scouting look at Kyle Barraclough of the Marlins and even “checked in” to see if the Rockies might be interested in parting with veterans Wade Davis or Adam Ottavino. (Crasnick added mention of Ottavino in a follow-up tweet.) All of those hurlers throw from the right side, of course. And they are in quite different contract situations, with Barraclough on the cusp of arbitration eligibility, Ottavino set to hit the open market, and Davis still in the first season of his three-year, $52MM contract. Davis, in particular, appears to be rather an unlikely player to move, as Crasnick notes. But the fact that the team has even considered that pursuit seems telling. There really aren’t all that many excellent late-inning rental relievers likely to be made available — Jeurys Familia is probably the best among them — but there are quite a few quality pitchers with lengthy control rights that could perhaps be had. Raisel Iglesias of the Reds, Kirby Yates of the Padres, Nate Jones of the White Sox, and Keone Kela of the Rangers are all pitchers that could at least conceivably interest the Red Sox. All are in the same essential situation as that of Barraclough, though: with multiple seasons of affordable control remaining, their teams don’t have to make a move. As things stand, then, the possibilities still seem rather open-ended. That only makes it all the more interesting to see how talks shape up over the next twenty days. 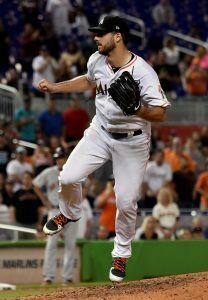 Following another rough outing for righty Brad Ziegler, Marlins manager Don Mattingly announced to reporters that right-hander Kyle Barraclough will take over as the team’s closer (link via Joe Frisaro of MLB.com). While Ziegler, 38, technically only has one blown save on the year, it’s been a nightmarish start to the season for him all the same. He’s been scored upon in 10 of his 24 appearances (including three of his past five) and is currently carrying a 7.83 ERA with 34 hits, six walks and a hit batter through 23 innings. Ziegler’s 5.9 K/9 is right in line with his career mark, and he’s still showing good control (2.4 BB/9) with excellent ground-ball tendencies (68.7 percent). However, the submariner is serving up hard contact at a 46.5 percent clip after registering a 28.2 percent mark in that regard a year ago. Ziegler is playing out the second season of a two-year, $16MM contract and is owed the balance of a $9MM salary through season’s end. While the organization’s hope had surely been that he pitched well enough to be a desirable trade piece this summer, that hasn’t been the case thus far. He’ll presumably work in some lower-leverage situations for awhile, perhaps matching up primarily against right-handed opponents, as he looks to get back on track. As for Barraclough, the changing of the guard in the ninth inning presents him with his first crack at closing in the big leagues. The 28-year-old has never displayed good control in the Majors (5.5 BB/9 in his career and in 2018), but he’s mitigated the damage of those free passes, to a large extent, by racking up impressive strikeout numbers. Barraclough has averaged 11.8 K/9 in his big league career and has a 10.0 mark in that category so far in 2018. The move comes with plenty of financial implications for Barraclough, as well. The righty will be eligible for arbitration for the first time this offseason and has already 64 holds in his big league career. Adding four months’ worth of saves to his resume, assuming he is able to continue pitching well in his new role, would further his impressive resume and build a nice case for a a first-time payday in the arb process.